Season Long Leagues at DraftKings! So it’s time! To finally take that plunge and test your NFL football knowledge in your quest for fantasy football championships, prestige, and all the prizes afforded to the winners. OK, so how do we do this? We’ll review the traditional season long league which is the basic fundamental type of league for all NFL fantasy football players. 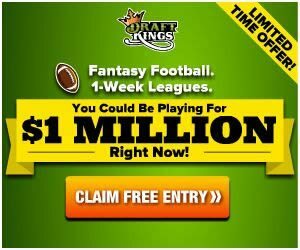 DraftKings.com supports both daily/weekly fantasy football as well as season long leagues! Click here to set up your season-long leagues at DraftKings! Read our full DraftKings review here. Season long leagues start in week 1 of the NFL season which starts on Thursday night usually in the first week of September and commonly conduct their fantasy championship in week 16 of the season. For first-timers or new commissioners looking to create your own league, let’s get this out of the way right now. Yes, there are 17 weeks in the NFL regular season because each team gets a bye week, or a week off. Why aren’t championships conducted in week 17? Playoff bound teams or any teams that have nothing to play for in week 17, for example, these teams locked up their division and say have home field advantage throughout the playoffs, have little incentive to play their starters for the entirety of this game, looking for an opportunity to rest their star starters/injured players. These star starters may very well be the reason why a particular fantasy team is in the championship in the first place. And then to have these players basically unplayable in week 17, can create havoc in your lineups in the most important week of the season. That is simply the reason why fantasy football championships are conducted in week 16, when usually, not every playoff/home field scenario is written in stone. Playoff structures may differ in which week they start, but ultimately they should end in the championship weekend of week 16. Click here to learn how to play fantasy football dfs leagues. There are five types of leagues in traditional season long fantasy football. The re-draft league is the most common type. Each season, players draft their teams from scratch based on their draft order using a snake format. Snake format basically means whatever order you pick in the first round, it reverses in the second round, and continues back and forth. For example, if you have the last pick in the first round, you get the first pick in the second round, and this pattern continues back and forth until your team is filled. The draft order is usually randomly generated when the league is full. A tip for new commissioners would be to randomly generate the draft order once your league is filled as opposed to like 30 minutes before your draft starts. The reason for this is because it will save everyone time. For example, if you know you have the eighth pick out of 12 players in advance, you will have a general idea of who will not be available to you by the time your pick comes up and thus do not have to bother with thinking about unrealistic scenarios. Also, you can plan ahead and participate in mock drafts using your known draft order to get a good sense of what your team may end up looking like. Keeper leagues work like re-draft leagues except you keep a certain number of players for the following season, and draft the remainder of your team like in the re-draft leagues. The commissioner will set up the particular rules of this type of league, like how many player spots you can retain. Keeper leagues will need players that are committed to multiple years. Dynasty leagues are similar to keeper leagues, except you keep most or all your players from the previous season. Strategy is geared towards planning for the future as young players with a lot of potential will be targeted higher than in re-draft leagues. Like with keeper leagues, dynasty leagues will require players committed to multiple years. Auction leagues basically give each player a set amount of salary cap money to spend on players. There is no snake draft since players can bid on any player at any time. The strategy here is spreading your salary cap amount to field an overall solid team and not overpaying for players. Best Ball leagues do not require you to alter lineups week to week. Your best performing players on your roster are automatically in play. In joining or creating a league, you will definitely need to know the league parameters, as this will affect your strategy approach. Ideally, leagues will consist of at least 10 players, but usually 12. Say with a 12 player league, you will have a fair balance of stud players available to everyone at most positions, regardless of your draft order slot, especially in point per reception leagues (PPR). Fantasy leagues must have an even number of players, say 8, 10, 12, etc. There are no bye weeks for your fantasy team during the regular season. Once you know what type of league you are in and how many players are in your league, identify whether it is a standard or a point per reception (PPR) league. PPR leagues are basically what it says; skill players get some type of points per reception, either half PPR (.5 points) or full PPR (1 point). Standard scoring does not award a point per reception. PPR scoring has become very popular as it evens out the playing field with running backs. Wide receivers and tight ends could conceivably be drafted in the very early rounds versus standard leagues where running backs dominate. Also, the running back field gets broadened to include the receiving backs. For example, in 2014, wide out Antonio Brown was the highest scoring fantasy player at all positions outside of quarterback in full PPR scoring (no bonuses). DFS note: All DFS sites implement some sort of PPR scoring system. During the off-season, most sports sites will have their versions of player rankings for the upcoming season. Unless stated otherwise, these rankings are based on standard scoring, so if they do not have a PPR rankings list and your league is a PPR league, your personal player rankings may vary greatly from these outside of the quarterback position. You will need to know exactly how your league’s scoring system works. There are endless variations to how this can be set up so knowing this will be vital in ranking your players prior to your draft date. The live draft date must occur sometime before the season starts in week 1. It is suggested to set this date that is convenient for everyone to participate as late as possible. For example, if you set your draft date in July before the preseason starts, and some player you drafted gets injured during the preseason, well, that could basically leave you in a bad bind before the season even starts. Let’s run through a very basic common scoring system format for a full PPR league without bonuses. QB, 2 RBs, 2 WRs, 1 TE, 1 Flex (RB/WR/TE), 1 Team Def/special teams unit (DST), 1 Kicker. Team defense would be the entire defensive/special teams unit of a team, like the New York Giants. The Defense spot(s) can vary greatly, since leagues can customize this to use individual position players instead of a team defense, or some combination of both. Using individual defensive players are referred to as IDP. IDPs may be structured like drafting 1 defensive lineman, 1 linebacker, and 1 defensive back, etc. In our example above we have 9 starting roster positions to draft. But there are also bench spots to draft for as well. This number can vary depending on league settings but knowing how many bench spots will be critical in drafting strategy, just as much as knowing your league’s scoring settings. For example, say if you have 4 bench spots, your drafting strategy may be completely different than if you had 6 bench spots. Having only 4 bench spots, you will have to keep a careful eye on the bye weeks of the players you draft. Let’s say 5 of your starting positions happen to have the same bye week. Even if you unloaded your entire bench spots to try and fill that bye week (and you probably really wouldn’t want to do this), you would still be one position short for that week. Also, having only 4 bench spots means you will probably have to stream defenses and/or kickers on a weekly basis, making those positions low drafting priorities in this format. If you find yourself having to stream positions on a weekly basis, against other players that may be doing the same thing, you will have to be active and early on the waiver wire. Having 6 or more bench spots will give you the luxury of having a backup at most positions for the entire season, which makes bye week and injury/suspension issues less of a concern, and drafting the handcuffs for your star running backs, etc. possible. Also, waiver wire activity would be less since most desired players would already be owned. Touchdowns (TD) scored by anyone for anything count for 6 points. However, there is usually one exception to this for quarterbacks for passing TDs which may count for 4 points. Rushing TDs for quarterbacks still count for 6 points, as this only applies to passing TDs. The reason for this exception is to balance the playing field more so for all positions since quarterbacks usually score the most touchdowns of any position. Points for yards are scored as 1 point for every 10 rushing/receiving yards gained by any position. Quarterbacks score 1 point for every 25 passing yards gained, or .04 points for every passing yard. Tip for new commissioners: When creating your league settings, it is recommended using fractional points. For example, with fractional points, a running back ending up with 89 total rushing yards in a game would receive 8.9 points for this particular stat as opposed to 8 points without fractional points. The reason for this is to help reduce the chance of games ending in a tie. Ties basically negate the effect of total accumulated points scored throughout the season. Total accumulated points scored are tracked as well as win/loss records. For example, say the top four teams in your league currently have a 4-2 win/loss record. The team with the most total points at this point in the season would have sole possession of first place. Now, let’s say this team with the most points had a record of 3-2-1. This team would now drop to 4th place and the benefit of having the most points in the league would be lost, except against the other team that also has a tie. This isn’t soccer and everyone hates ties. Also, if you are playing in a money league, pay out structures may often payout to whoever scored the most points during the regular season. DFS note: All DFS sites use fractional points. Offensive players can also score 2 points for a 2-point conversion, similarly to how any of them would score a touchdown, but 2 points in this circumstance instead of 6. Negative points can also occur for any offensive turnovers like interceptions or fumbles lost. These are commonly assigned a -1 or -2 value. Kickers (K) can earn 1 point for every extra-point (XP) conversion. They can also score at least 3 points for every field-goal (FG) made. Some variations for more points are possible for longer FGs, for example, a FG of 50 yards or more can be assigned 5 points. Bonuses – Some additional offense scoring scenarios can also be set for players. For example, players that get at least 100 rushing/receiving yards in a game can receive additional points. And for QBs that register at least 300 passing yards in a game can receive additional points as well. DraftKings.com implements this bonus format. DSTs can gain 6 points for scoring TDs either from an interception return, fumble recovery return, any blocked kick/punt returned, and for any kick/punt returned. DSTs can also score points for sacks (+1), interceptions (+2), fumble recoveries (+2), blocked kicks/punts (+2), and safeties (+2). DSTs can also score or lose points based on how many points allowed by this unit. For example, DSTs that shutout the opposing offense can score 10 points. DSTs allowing 1-6 points can receive 7 points. DSTs allowing 7-13 points can get 4 points. DSTs allowing 14-20 points can earn 1 point. DSTs allowing 21-27 points get 0 points. DSTs allowing 28-34 points lose 1 point. And DSTs giving up 35 points or more lose 4 points. Defensive point scoring can wildly fluctuate because of its unpredictable nature, but if you have the right matchup at the right time, this could be a huge factor. At this point, we know what type of league we’re in, the league size, our positions and bench spots to draft, how scoring works, what the draft order is, and the draft date. Whatever site you are playing on (yahoo, espn, etc. ), you can look back at last year’s player stats which will be tailored for your particular custom league scoring system. This will be helpful in identifying tier rankings for each position. You will also notice that particular site’s player rankings for the upcoming season. You have the option of modifying the computer rankings and creating your own and saving/modifying this for future use. Mock drafts will be a great way to see what the consensus opinions are of the rest of the world so you know who may/should be available to you in that critical first round. You can tailor mock drafts for the number of players in your league and what your draft order is. There are many sites that you could use for this, but whatever site you are playing on will have this tool available as well. It would be prudent to follow off-season news prior to the draft. For example, you don’t want to be “that guy” that drafted some player that is suspended for the first four games of the season and didn’t know it. The one thing that reviewing last year’s stats won’t reveal is the impact of the influx of rookies coming in every season. Mock drafts would be a good way to see what the rest of the world thinks of the potential of the rookie class. The NFL draft occurs in April. We’ll all know which rookie went where afterwards and let the breakdowns begin! So now we have our player ranking lists/cheat sheets and are ready to go. This may be the most important day of the fantasy football season. But whatever the outcome of the draft, your team may look drastically different by the end of the season because of injuries, waiver changes, and trades. While you are drafting, there will be interface tools available to you. You can sort by teams in your league and their current rosters to see what positions they have filled and still need to fill. This may help you anticipate who may or may not be available when your next turn comes up. This will likely be helpful in the later rounds, but you will have to anticipate this quickly on the fly. While you’re drafting, a queue will be available as well. The queue lets you add undrafted players that you would want to draft in the order you place them. If you have undrafted players in your queue, and you do not pick a player before your time is up, the first player listed in the queue will be drafted for you. Players in the queue that are drafted are automatically removed. It is recommended to use the queue and the reason for this is software glitches. For example, yahoo’s site implemented a new drafting interface last season that was very glitchy to say the least. What happened is when it froze or glitched, it would automatically log you off the interface. You would then have to log back in, however long that takes your system to do. If this happens during your turn to pick, and you didn’t have your player(s) in the queue, the auto-draft software kicks in and will draft the next player the site had ranked, or you had ranked if using your custom ranked list, whether you wanted him or not. Use the queue, you have been warned. The league commissioner sets how much time each team has to make their pick each round. This is usually 60 or 90 seconds. That may seem like a lot of time, but especially in the later rounds, it goes by quick as you may be looking at a ton of different things before that 10 seconds left timer starts going off. Again, have at least one player in your queue well before this happens. Your fantasy site will draft for a team that is not drafting live. The players that are auto-drafted for this team will go in the order of the site rankings list, unless this team is using their own custom ranked list. If using the site ranked list, Auto-draft teams will fill out all their starting positions first before any bench spots are drafted. If you have any teams in your league being auto-drafted, it will be easy to tell who that team will pick before your next turn comes up. Now that you have drafted your team, you can start planning for the season. You should be making notes of when your player’s bye weeks are and be prepared for those adjustments. The bye weeks start in week 4 and continue every week until week 12 is complete. Depending on the season schedule, anywhere from two teams up to six each week will have a bye during this time. Now that the draft is over, you have the opportunity to review how all your opponents in the league drafted. This may be helpful in the future in identifying potential weaknesses. For example, if you identify a team that has a weak running back corps and your team happens to be deep with running backs, you may be able to exploit this with a potential future trade scenario. You should also scout your opposition schedule as well. For example, if your QB has a bye in week 6 and your opponent that week also has a QB with a bye during that week, and neither of you have a backup QB, you could both be competing for the same QB off the waiver wire for that week, so you will need to plan ahead. During the season, inevitably acquiring new players and dropping current ones due to injury, suspensions, arrests, etc. will occur. Players that were not drafted will be available on the waiver wire. Any player that is dropped by another team during the course of the season will be added to the waiver wire throughout the season. You will need to understand your league’s waiver wire rules as this can vary greatly. The waiver wire will be the main source of any team’s lineup changes. Knowing how and when you can do this in your league is a must know. During the course of the season, the other method of acquiring players will be via trade with another team. League commissioners may set a deadline for when trading players will end, similar to the NFL. It is also recommended that new commissioners implement some sort of review system or league wide veto vote for trades. Doing this can avoid potential contentious situations. For example, where two integrity challenged friends in the league want to make a dubious trade or some contender is trying to take advantage of a noob. If you play in season long leagues over the years with the same core players, you can always review the draft results from prior seasons. If you can identify patterns of how certain players draft, as this could give you some insight on their approach to strategy. For example, one particular player drafts running backs with his first two picks every season, etc. No exception. Everything about the NFL is about matchups, whether it’s season long leagues or especially in DFS contests. For season long leagues, planning for the future is a must. For playoff bound contenders, playoff matchup scenarios will need to be planned for in advance. For example, one season I had a QB with a bad matchup for our league’s super bowl, if I got there. This QB contributed to my success all season long however and this was not an easy call. I picked up Kurt Warner (w/ the Cardinals that season) off the waiver wire with a plus matchup for week 16, ended up starting him, he had a huge game, and I ended up winning our league’s championship because of that play. Having a constant eye towards the future will always serve you well. We have covered a lot of the potential aspects you could expect to face in how to play fantasy football. If you play fantasy football long enough, eventually you will see it all. At this point, if you have implemented the suggestions in this guide, you should have a general smooth sailing in what you will discover to be a very competitive, addicting, and fun experience. Good luck and enjoy the upcoming season! Click here and set up your league at DraftKings!